Situated just off Interstate 29, Exit 215, in Pembina, ND. The Museum Store closes one half-hour before the museum closes. Closed New Year’s Day, Easter Sunday, Thanksgiving Day, and Christmas Day. The Pembina State Museum features a modern meeting room with an adjacent kitchen that is available to rent. After hours use of the lobby area and back lawn are also available for groups. Contact the museum at least two weeks in advance of the gathering for reservations. Free admission for the exhibits and museum store. Follow the river graphic in the sidewalk inside to discover 100 million years of the region’s history. See fossils from a time before glacial Lake Agassiz as well as stone and bone tools of the first peoples. Examine the Red River oxcart and other objects of Pembina’s fur trade industry. Investigate the history of frontier military forts and the U.S. and Canadian border survey. Learn about the diverse peoples who call Pembina home, including Native American peoples and Euro-American settlers. Find out about agriculture and transportation industries that continue to play a role in the economics of the Pembina region today. This 1000-square-foot gallery hosts changing exhibits that highlight specific topics in the state’s history, featuring the diverse collections of the State Historical Society of North Dakota. 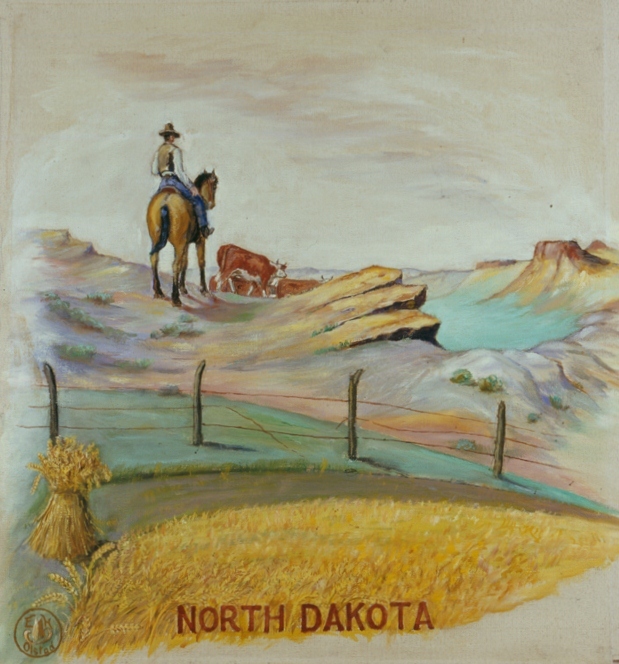 Inspired by the people, scenery, and ranch life of the Dakota badlands, rancher artist Einar Olstad (1878-1955) captured the essence of the American West in his whimsical and often humorous portrayals of the Dakota cowboy. In addition to a wide selection of his evocative paintings, objects relating to ranching life in the 1930s will be on display. Follow Pembina State Museum on Facebook!